Here’s a library trick. When a book is very popular and has a long wait list at the library, request both the regular edition as well as the large print edition. 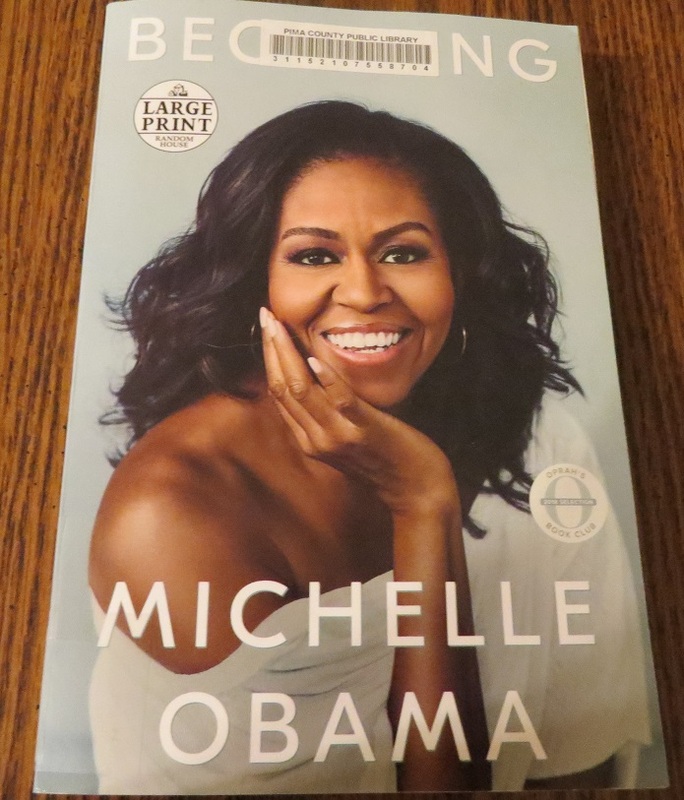 I wanted to read Becoming by Michelle Obama, but I was number 576 on the wait list for the regular edition. I was number 74 for the large print edition, which I ultimately ended up receiving much earlier than I would have received the regular print edition. I wasn’t sure what to expect with this book, but overall I enjoyed it. I liked reading about Michelle Obama’s upbringing on the South Side of Chicago. I enjoyed hearing about her tight knit family, even if her father, who wouldn’t see a doctor for his health issues, drove me a bit batty. At first, I was envious of her relationship with Barrack because they seemed like such a perfect match. However, while Barrack is no doubt a good spouse and good match for Michelle, this book really drove home the sacrifices his family had to make for his political drive. Being married to him and sacrificing her own career and goals to support him would not have been easy. I honestly hadn’t thought much about what it would be like to live in the White House or how isolating it can be. Michelle Obama writes that she could no longer run to the store for a simple errand or even go outside to get some fresh air. All of her movements had to be carefully orchestrated so that she was always protected. The same went for her daughters who often just wanted to be normal kids. Undoubtedly, living at the White House as the First Family has major perks, but there are also stifling drawbacks. Overall, I enjoyed this book and her perspective. I also enjoyed that we lived in Chicago during many of the events in this book, so it was fun to see things I experienced through Michelle Obama’s eyes. I give this book 4 out of 5 stars on the Mom’s Plans’ scale. Visit Melissa Batai, MomsPlans.com's profile on Pinterest. Mom's Plans is a participant in the Amazon Services LLC Associates Program, an affiliate advertising program designed to provide a means for sites to earn advertising fees by advertising and linking to Amazon.com.